It is VERY important to remember that all of these tests are related to your ability to detect color (of course) and when you take a test online, you are not in a controlled environment. Combinations of the background, lighting and your monitor can all work to alter the shades of the colors from their original state. This is the very same principal on which some people attempt to cure color blindness, by altering the shades seen at your retina before travelling down the optic nerve for processing by your brain. At best, any online test taken should be used as a reference only and if you tested positive – see an eye specialist for confirmation. 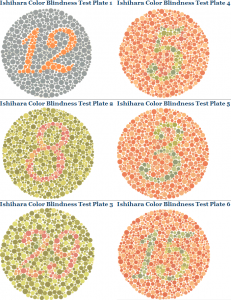 The first, and most common and widely used test for red green color blindness is the Ishihara color test. The test is made up of 38 pictures, called plates. Each plate is comprised of hundreds of dots of varying color and size. The central idea behind the test is that color blind people will have difficulty spotting the hidden message in contained within the multitude of dots due to inability to detect some or all of the slight changes in the shades / colors of the dots. The plates are designed to be increasingly harder to spot, which enables the test to identify the severity of a subjects condition, as well as the type (remember that within red green color blindness there are 4 separate color blindness types). It is relatively common to start with an eight plate test, and if results are unclear or positive – to offer a comprehensive twenty four plate test. The full thirty eight plate test is very rarely used – to even lay eyes on the last fourteen plates you would need to visit an eye specialist or order a full test from an online store! The test was originally created by Dr Ishihara during his tenure as a professor at the University of Tokyo, in 1917. 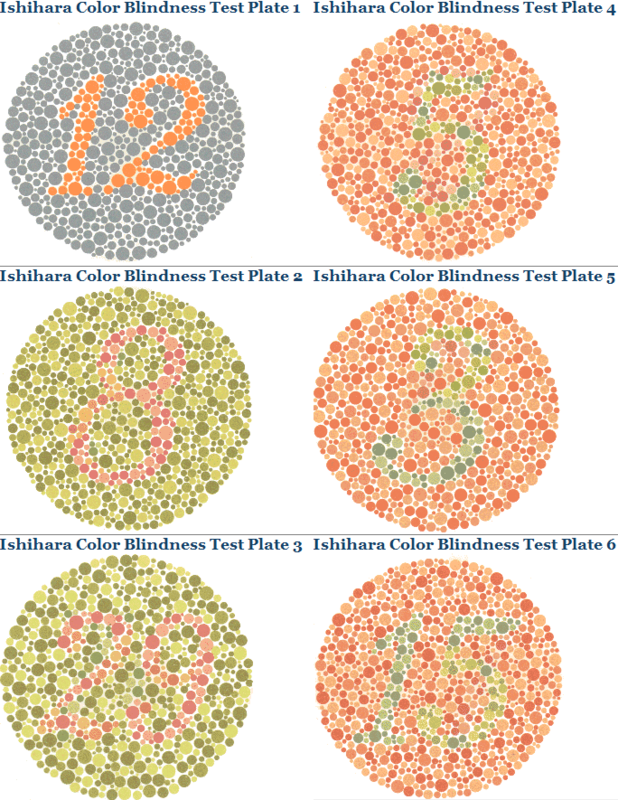 Below is an example of 6 plates, for a full and comprehensive online test, visit the Ishihara Color Test at www.colour-blindness.com. Taking the test is highly recommended if you cant spot all of the numbers contained in the sample below! The D-15 Farnsworth Dichotomous Test otherwise known as the Color Arrangement Test was developed by an officer in the US Navy in 1943 as a testing & screening tool for the Navy. After 4 years of work by Commander Dean Farnsworth and Deane Judd, the D-15 test was born in 1947. The basic test involves arranging a series of colors in order as they blend from one shade to another to determine the type and severity of the subjects color blindness. in 1988 the test was further advanced by usage of a mathematical formula developed by Vingrys and King-Smith designed to provide a “color difference vector” to each test subject. The vector can be plotted against the 3 lines of confusion (red, green, and blue) to enable a quantifiable method of rating an individuals condition. Off to a bad start on the Farnsworth Test. 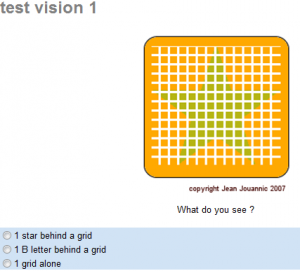 An interactive online version of the Farnsworth test developed by Daniel Flück at colblindor.com. The below table shows statistics taken from a test of 120 people using this method, for an understanding of the terms used, more information can be found on this color blindness tests page. A Rather new test developed using the principals invented by Dr Ishihara but applied in a dramatically different way. The creator, Jean Jouannic has the full test on his website, which you can find here. The test builds on the foundations of the Ishihara test to also include testing for Blue-yellow colorblindness, which was not possible using the original Ishihara test. I cannot vouch for the accuracy of the test, and there is little evidence to back it. However, I assume the creator cross-referenced a number of test subjects against their results using other tests such as the Ishihara and Farnsworth as discussed above.